I dumbly thought this might be an LCD Soundsystem cover since it’s the title of one of their staple songs. An ode to all-night partiers who see their social lives as something to be battled through, fueld by an overwhelming need for stimulation and the desperate pursuit of it. 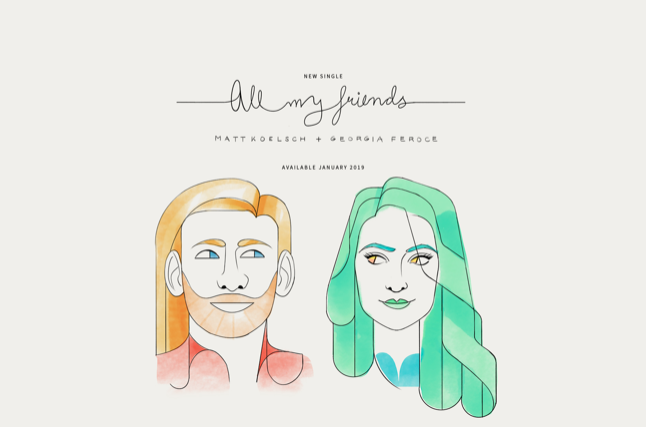 Matt Koelsch’s “All My Friends” is its own song however, and that’s just fine. The sentiment is still similar. We need friends. The song’s music video even starts with an intro section which includes what seems to be friends chatting at a house party. We catch snippets of chummy convo before seeing Koelsch playing an acoustic guitar, even though all we hear is a piano. He performs and sings while surrounded by all manner of recording equipment, which I find odd until reading that the song being played during the video is the actual live performance, unedited. We next see that the piano is being joyfully played by another girl of the same demographic named Katelyn Redwood. The camera then pans around as the house guests are shown to be the choral group of the song. It’s a catchy chorus and definitely highlighted from so many voices singing it together. Although I’m not a big fan of acapella refrains, which this song unapologetically struts out later, accompanied by handclaps and enough grinning, singing faces to fill a “Glee” episode, it’s likely because I’m just jealous that I don’t have as many friends who could sing this good. Both Koelsch and Feroce are based in Los Angeles but come from the Northeast. I’d like to believe that it's possible they actually picked up this many talented friends from spanning that much distance. Or maybe the 15-member chorus was hired. In either case, it’s a song that’s impossible to sing without smiling. The song ends on Koelsch’s isolated voice: “All my friennnnnnds…” You can almost see him trying to hold back from smiling, but he can’t. Creating music with this many people is obviously a good feeling. Want to listen? Purchase below!